Defense Minister Moshe Ya’alon praised the IDF strike Tuesday that killed a terrorist in Gaza who had been firing rockets into Israel, including 2 rockets launched during former Prime Minister Ariel Sharon’s funeral last week. 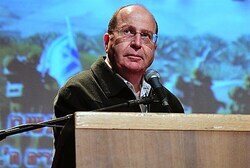 Ya’alon commented Wednesday on the strike that killed Ahmed Zaaneen and Mohammed Zaaneen of the Popular Front for the Liberation of Palestine (PFLP). “The IDF and general security services attacked and killed two terrorists in Gaza tonight who were responsible for firing rockets at Israel,” said Ya’alon, who confirmed that the terrorists were responsioble for the rockets on Sharon’s funeral. “We see Hamas as responsible for the firing on Israel, and if they can’t impose their authority over the terror organizations acting in their territory, we will continue acting to exact a very heavy price from those dealing in terror and firing at Israel,” he added. Ya’alon’s statements come after a barrage of rocket fire from Gaza last Wednesday reportedly caused defense officials to declare the Operation Pillar of Defense ceasefire, brokered by Egypt in early 2013, as moot and dead.